In today’s day and age finding a reputable service company that you can depend on when your schedule is to demanding is difficult to find. Red Hot services is a one stop shop that offers quality work at affordable pricing. We are not just another service company, we are a professional pressure washing company that you can count on for years to come. 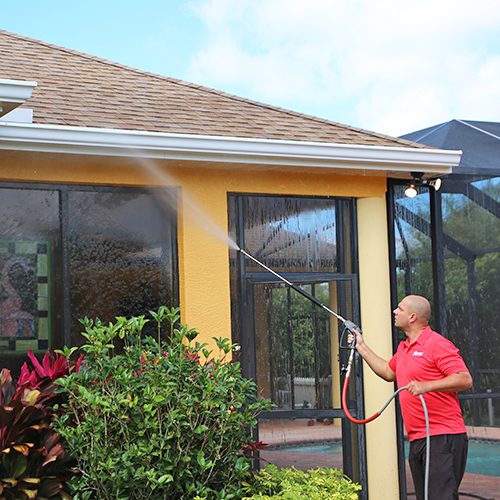 Red Hot Services provides house washing and pressure washing services to the Sarasota surrounding area. Our technicians use a very low pressure technique called soft washing to remove mold and dirt from your homes exterior. We pressure wash residential homes as well as commercial properties. Red Hot Services offers house washing services as well as pressure washing, roof cleaning, brick paver sealing and much more. Having to wash your house in Florida is very common. The humidity and mildew cause mold and algae to grow at a rapid rate. Keeping your home’s exterior throughout the year can seem like an impossible task. Red Hot Services offers a proven maintenance solutions to keep your home clean all year long. Here is how we do it. Cover all electrical outlets – Covering your door bell and any electrical outlets is another step we take to make sure your home’s electrical system is completely protected when we are soft washing your home. Applying Detergents – Our technicians will apply detergents to your siding, windows and doors. Our detergents are custom blended to kill mold at the roots to prevent further growth. Rinsing – Finally your home is rinsed and windows are treated with a streak free solution. Your plants are then watered again for good measure to make sure they are in good condition when we leave your property.